This is the first large print edition of The Dark Wind. This is the fifth book in Hillerman's Navajo Mystery Series and was published in 1984 by Thorndike Press in Thorndike, Maine. 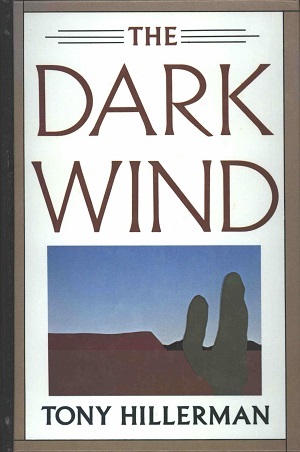 The cover art is credited to Mimi Harrison and features a simple depiction of a typical southwestern horizon with the sun rising behind a red mesa ridge and a Saguaro cactus in the foreground. Format: Hardback, 21.5 x 14.5 cm. Binding: Full color boards with full color design. Spine is black with the author name, book title printed in white. At the bottom the publisher's device is imprinted vertically also in white. The back cover has summary of the novel, a brief biography of the author, followed by "Thorndike Large Print".